Naxos is not just the largest, but also one of the most interesting of the Cycladic islands. 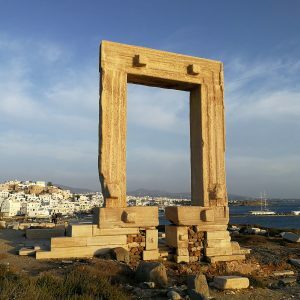 Thus, we were happy to make use of yesterday’s change in plans to spend the day showing our guests around some of the key sights in the island – we could spend many days on Naxos, there is so much to see. What a day it was! We saw the ancient sanctuary of Yria, mythical birthplace of Dionysos, the god of wine, where archaeological excavations have revealed a series of temples ranging from the eighth to the sixth centuries BC, culminating in what might be the first fully stone-built temple in Greece. Their scant remains are cleverly visualised, and understanding is helped by good guiding… Then, we continued into one of the agricultural heartlands of Naxos to view the sanctuary of Demeter at Gyroulas, also originating in the eighth century BC, with a most unusual temple from about 530 BC, another pioneering structure. 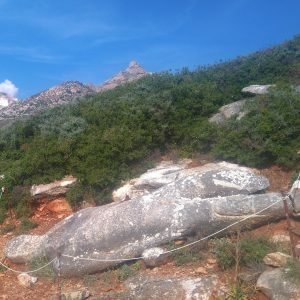 After a most delightful village lunch, we explored the ancient quarries at Flerio, with the famous sleeping giants and an unusual little sanctuary – I have written about these sites before. In the late afternoon, we returned to the boat and set out for the island of Rheneia, next to Delos, and I am writing this in a quiet cove off Rheneia. The above summary omits a key highlight of the day: the church of the Panagia Drosiani (the Virgin of the Dew, or of the Pleasant Chill), near the village of Moni. The Drosiani is central to our tours of Naxos, because it stands for a very significant part of the island’s cultural heritage. Naxos is justly noted as a key locale for an important Bronze Age culture, as the seat of a major Classical city state and as the main venue to a unique trajectory of Venetian history. 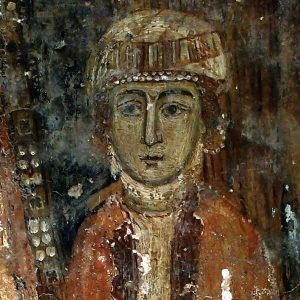 It is also home to a remarkable wealth of Byzantine chapels and churches, many of them with painted decoration, spanning the entire era of Byzantine Christianity from the Late Roman era to the 13th century, when the island fell to Venetian rule. The Drosiani is a distinctive and very beautiful part of that heritage. The small church is a surprisingly early structure, its core originating in the fifth or sixth century AD, with additions from subsequent centuries. Most strikingly, the eastern part of the church is decorated with a rich fresco programme that can be mostly dated to the seventh century. 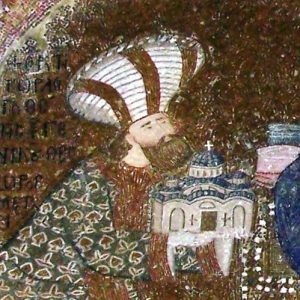 It is probably worth a post of its own, as it appears to express views on the major theological conflicts affecting Christianity at that time, before the Eastern and Western churches officially split, centuries later. Much of the discussion was about the nature of the Saviour, whether he is to be seen as human, divine, or both. In this context, attention is often paid especially to the dome of the Drosiani, its painted decoration split in two, with one depiction of Christ as a young man, representing his human nature, and another as an old sage or judge, standing for his divine nature, the ensemble expressing the controversial duality. This is complex stuff, and it might be material for a future blog post by someone who knows more about it than I do. Tomorrow, we will explore Delos.